This part of the decree’s article I will be immediately executed in all sub post offices, except in Banana, Boma and Matadi (1) where such “enregistré” has no reason to be setup, because the registration service exists. The cost of an “enregistré” letter for interior mailing is 15c. postage + 15c. (“enregistré”) fee for a total of 30c. « enregistré » is an interior service but can however be applied to items to foreign countries, to the moment where they arrive in the international postal service : they can receive an acknowledgement of mailing at the starting post office and be indicated on the dispatch sheet which accompanies the dispatches from the sending post office to the exchange post office (Boma or Banana). Such an “enregistré” item is and remains an ordinary piece of mail during its’ travel in international postal service unless it has been registered at one of the post offices authorized to receive mail of this type. Thus, the sender can, at an interior sub post office “enregistré” an item to foreign countries ; franked 50c. (ordinary rate for foreign countries) + 15c. (fee for “enregistré”). When this item arrives in the Lower Congo, it should be registered by the sender’s agent (mandatary)(2) for a normal fee of 50c. If the sender doesn’t have an agent (mandatary) in the Lower Congo or if the agent isn’t advised of the letter’s transit to be registered, the interior post office has agreed to accept , if the postage paid equals 1.15 fr(3), corresponding item in “enregistré” state, to be registred at Boma; in this case, they will inscribe on the sheet of dispatch sheet the note : “ to be registered at Boma post office, postage paid” + the sender’s name. The administration assumes no responsibility in case of loss or delay in the transmission of “enregistré” items, it has judged useless to make registers reporting the delivery of those items to the addressee and has limited the establishment of special registers for deposits, numbered from 1 to 500 ; the receipt detached from those registers will be the sender’s receipt. It doesn’t appear necessary for the most part to modify the text of theadvice sheets used in the interior relationship between post offices ; it will suffice that the postman cancel with large marks the word “recommandé” which is found at front of those sheets and replace it with the word “ enregisté”. Labels for applying the word “enregistré” on letters submitted for this service, will be sent in a short time to all sub post office, at the same time as the special registers in question. The “enregistré” number will be handwritten by the postman, next to the “enregistré” marking. The above instructions will be given notice at all concerned post agents. On March 15th, 1900 Léopoldville became a principal post office (in the past, a sub-post office) and thus the first registration post office met by the interior mails. 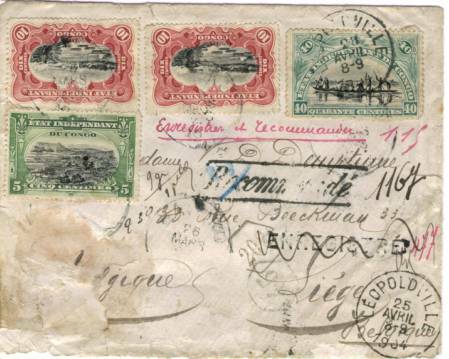 All known covers (with one exception) are dated in the 20th century and thus have been registered at Léopoldville ; only one is known dated in the 19th century and has been registered at Boma in 1899. No Mols stamps were issued to pay this postage rate (1.15 fr) with only one stamp ; this “enregistré” service was temporary, created only for a small demand. 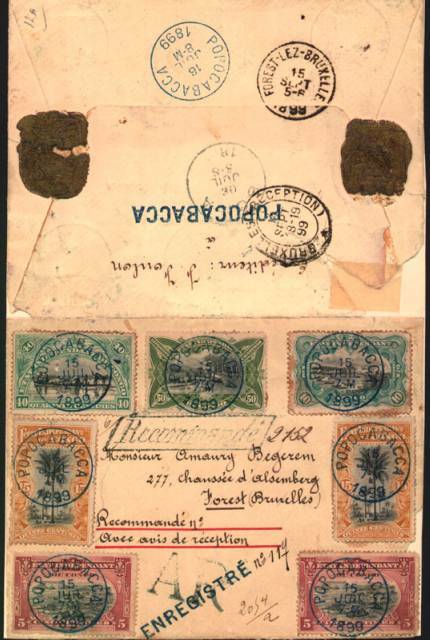 The letters which must be registered at Leopoldville for international destination, are generally (3) franked with sufficient postage which was applied by the sender and sometimes with the notation “to be registered at Leopoldville”. We have never seen any addition of stamps to pay for registration, by a mandatory agent at Boma or later at Leopoldville. (2) However, some mailers have sent their letters only “enregistré”, without registration ; whether on account of forgetfulness or for protecting their letters only during their transportation in the Congo. We can thus see the mention, hand-written at Leopoldville : “postage rate insufficient for registration” No postal form, including dispatch sheets, acknowledgments of receipt (registration) or acknowledgment of “enregistration” has yet been seen with “enregistré” marking. The Fuch’s postal decree gives us the starting date of the “enregistré” service, but no decree gives the end. Only the registration service’s penetration into the Upper Congo establishes those limits. The search for the first known dates of registration in the Upper Congo could set the limits of the use of “enregistration”, on a post office by post office basis. However, it would seem that in Middle Belgian Congo, the registration service was completed around 1905 and in 1907 for the Upper Congo. 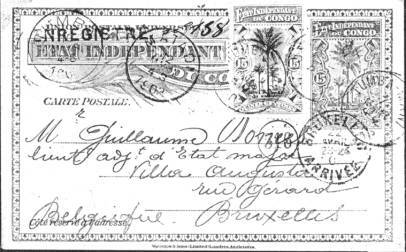 By 1909, the post offices of Belgian Congo no longer had an “enregistation” service. 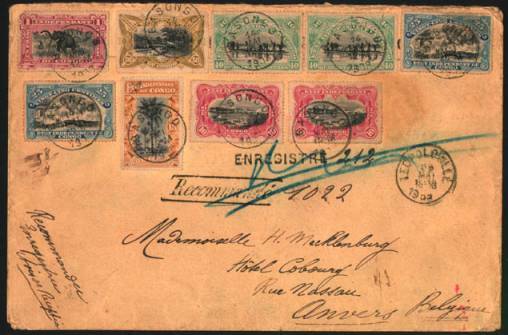 Cover sent from Basoko March 26th, 1904 to Liege, Belgium where it arrived on May 23rd. “Enregistré” number 477 and franked with the complete postage rate (a 50c. Mols is missing.) at Basoko. All stamps were cancelled at Basoko. Bumba transit April 1st and arrival on April 25th at Leopoldville where the “enregistré” mark is cancelled with pen and the registration number 1167 was applied. The postman cancelled a second time the 40c. which had received a poor (insufficient) cancel at Basoko. 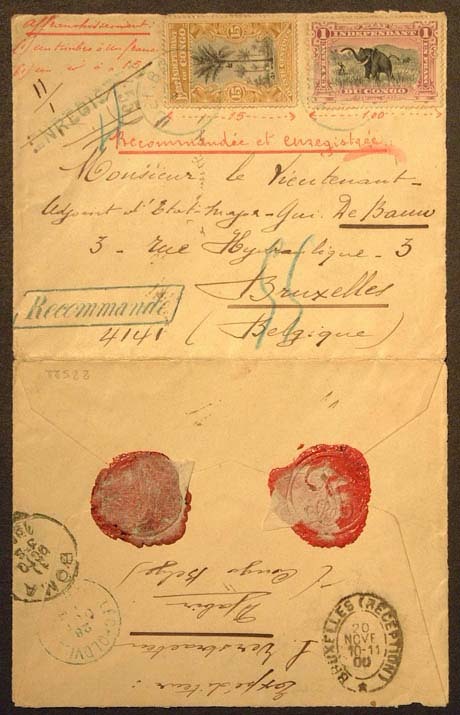 The registered cover continued its’ journey and finally arrived at Brussels and Liège on May 23rd. Shown on the previous page is a letter sent from Ibembo to Brussels where it arrived on November 20th, 1900. "Enregistré" number 4, franked with the exact postage rate with remark "to be "enregistered" and registered". All stamps cancelled at Ibembo. When it arrived at Leopoldville on October 28th, the "enregistré" mark was cancelled with pen and registration number 4141 was applied. Transit Boma at October 31th, 1900. Note the break on the left of the Léopoldville "recommandé" marking, which during 1901 will lose its' small oblique bars . (Part of left bar already lost). 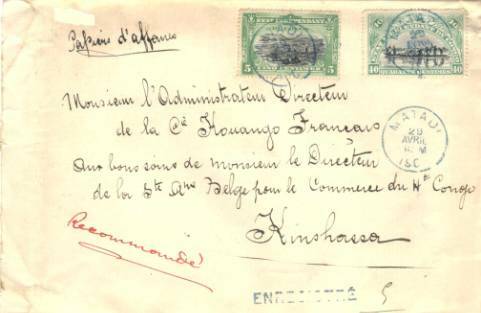 Exact franking of 1.15fr with 1fr lilac (registered international letter) and 15c. ochre (enregistré). The sender marked in red around the stamps in order to prevent any theft by the carrier before that the stamps were cancelled at the post office. Letter sent from Manyanga and stamped by the sender at 1.15fr, as postage rate of an “enregistered” letter to be registered. However, the first post office reached by the letter, Matadi on December 8th, 1898, was a principal post office which could register a letter for international destination :. The letter was thus not “enregistered”. The indicated weight of 11gr was weighed a second time as 8gr, both weights being a single weight. At Matadi the registration number 1 was added and all stamps were cancelled. This is an interesting cover because the sender living in the Upper Congo didn’t known if his letter would first reach a sub post office or a principal post office. Thus the sender franked the letter with the rate for inland “enregistration” and “registration” for international use. Now when we send a registered letter, we go to the post office and we pay the correct postage rate directly calculated by the postman. In the past, in the Upper Congo, the sender put his stamps on the letter and gave it to a carrier (a boy/native) to take it to the post office at a distance of many kilometres. If the applied postage was incorrect, the letter continued its’ journey with postage due or without registration if underpaid , or with a mention “stamped by the sender” if the sender put too much postage on the cover. This mention doesn’t always mean a philatelic item. 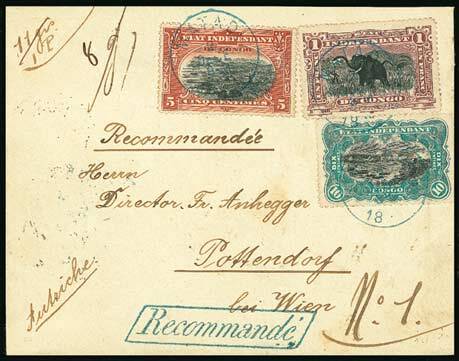 The above cover does not have the correct postage, as only 1fr was necessary for a registered cover, but the sender thought his letter must be “enregistered” and thus put on 1.15fr. It’s not a philatelic item but rather an historic item which can be explained according to this special decree of “enregistration” – particulary not easy to apply by the senders and sometimes by even by the post office itself. PPC sent from Ibembo April 30th, 1902 with Anvers transit to Eeckeren-lez-Anvvers where it arrived on June 10th. “Enregistré” number 388, with remark “to be registered at Leopoldville” It’s the last day of the 50c. postage rate for PPC. On May 1st, 1902 the rate became 15c. It arrived at Leopoldville on May 11, where the “enregistré” was cancelled with pen and registration number 804 was applied. 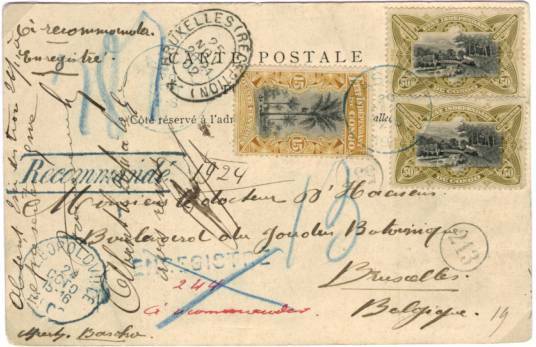 PPC sent from Basoko September 30th, 1902 to Brussels where it arrived on November 25th . “Enregistré” number 244, with remark ”to be registered”. It arrived at Leopoldville on October 24th , where the “enregistré” was cancelled with pen and registration number 1924 was allied. (postage rate see note X ). 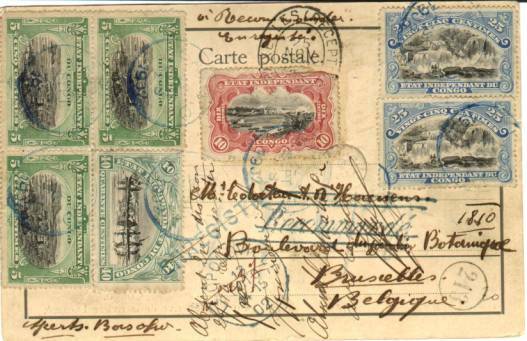 PPC sent from Basoko September 24th, 1902 to Brussels where it arrived on November 24th. “Enregistré” number 237, with remark ”to be registered”. It arrived at Leopoldville on October 13th, where the “enregistré” was cancelled with pen and registration number 1810 was applied. (postage rate see note X). The above three picture post cards (PPC) came from the same sender. The correct postage rate after May 1st, 1902 was: PPC (15c.) + enregistré (15c) + registration (50c.) = 80c., but these cards were franked 1.15fr based on the 50c. PPC rate prior to May 1st, 1902. The sender ignored the new rate and continued to mail at the past rate. Curiously there was no remark “stamped by sender” for excessive postage (always put on registered cover when the postage is overpaid) applied at Leopoldville when the cover was registered. 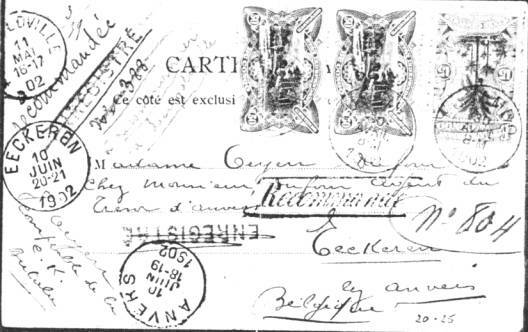 Letter (ex Du Four collection) from Popocabacca mailed on July 15th, 1899 to Brussels where it arrived on September 15th.“Enregistré” number 117 ; arrival at Boma on July 30th, registration number 2152 and “AR” (receipt requested). The only known nieteenth century “enregistré” item . Business letter mailed from Basongo on May 14th, 1903 to Anvers where it arrived in June 1903. “Enregistré” number 212. Arrival at Léopoldville on May 22nd , where “ENREGISTRE” was cancelled with pencil and registration number 1022 was applied. The letter actually weighed 58 grams, thus was a quadruple weight rate. The sender probably weighed the letter at approximately 60 grams and applied postage for 5 weights, thus 3.15 F in postage instead of the needed 2.65 F.
On the previous page,a postal card mailed from Tumbu-Mani on March 7th, 1903 to Brussels where it arrived on April 2nd. Transit at Tumba March 10th and Matadi March 12th. “Enregistré” number 158. No registration was requested. “Enregistré” wasn’t cancelled because the stationery couldn’t be registered. 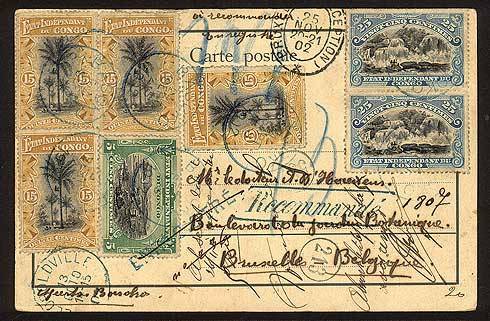 It continued on its’ journey to Belgium as regular mail, for it was only protected by “enregistré” within the Upper Congo. 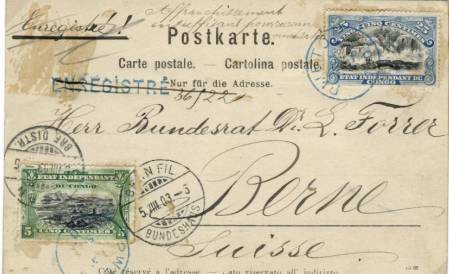 PPC from Pweto May 3rd, 1903 to Berne/Switzerland where it arrived on August 5th. Domestic printed matter  "enregistered"- 45 c.
Shown on the previous page is a letter from Matadi on April 29th, 1900 to Kinshasa. "Enregistré" number 5 with no registration. 45c' postage paid by sender. This is curious because Leopoldville became a principal post office on March 15th and thus the registration could be applied to Léopoldville at this time. Red hand written "registered" by the sender, but the Matadi's postman applied only the "enregistré". Perhaps the registration service to Léopoldville wasn't yet in use. Printed matter: 5c. per 50gr - 4x5c/200gr. Domestic registration: 25c. Total: 45c. Mr. Lindekens did the initial translation of his fine article from the original French to English. The editor has tried to further improve upon this translation. If this further translation introduced any errors the editor wishes to beg the author's and the readers' forgiveness.